Make delicious barbecue food for all the family and friends with Uniflame's 5 burner and side gas BBQ. 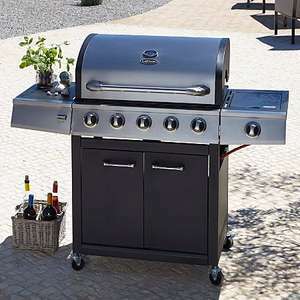 Ideal for your summer barbecue, its got a 28 burger capacity, with a side flush burner enabling you to cook sauces and sides to go with the main event. And the stylish lid allows closed lid, slow cooking for a deliciously authentic taste. Deal posting newbie! This is AdsCowen77 first deal post. Help out by leaving a posting tip or just to show your appreciation for their contribution.